EPDM rubber roofing offers a wide range of benefits compared with other forms of flat roofing. For this reason, it’s not surprising that its popularity over the last ten years has grown significantly. If you’re still not sure why, then allow us to convince you with the following five advantages! With many EPDM installations exceeding 40 years of exposure in the field under various climatic conditions, none of the material tested has shown alarming signs of degradation. Even though it would be difficult to predict, studies have shown aged EPDM membrane as having a potential life expectancy of 50 years! While the initial cost of installing an EPDM roof may be higher than a traditional three-ply modified bitumen roof, this increased lifespan will more than recover the costs in the long term. Supplied on rolls as wide as 50 feet, most roofs can be covered with a single sheet, removing the need for sealing joints that typically become unstable over time and cause leakage. 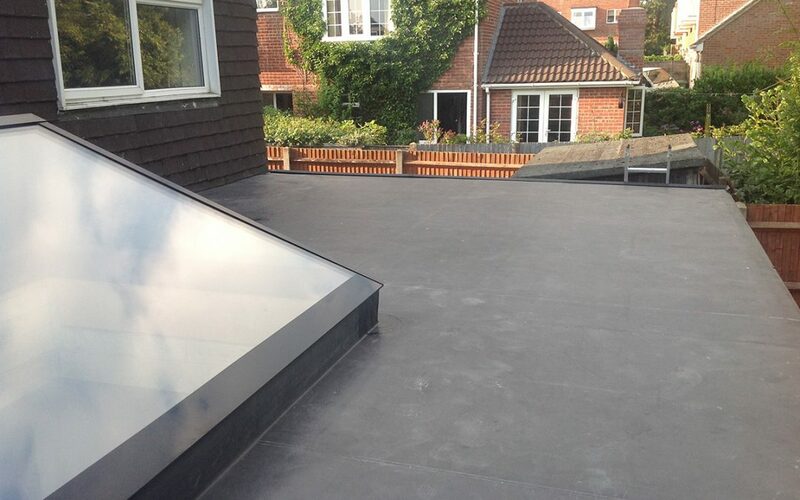 EPDM rubber roofing therefore offers a far more watertight solution. The lightweight material can also be easily shaped to fit the contours of the roof and can easily be repaired in the unlikely event damage. EPDM rubber roofing offers a more weather-resistant solution, with the ability to expand or contract according to the prevailing weather conditions. EPDM rubber roofing is one of the most sustainable and environmental materials used today in the construction industry. Both Greenpeace and ACTAC (The Association of Community Technical Aid Centres) have named EPDM rubber roofing to be the leading choice for roofing where environmental sustainability is concerned, due to its extended lifespan and re-usability. Its excellent performance transfers to low life cycle costs and less impact on the environment.